Either I’m really tired or this was one of the harder Fireball themelesses in recent memory. 1a was completely new to me and I think that threw me off my game a bit. 1a [Roman-fleuve] I know enough French to know “roman” is “novel” and “fleuve” is river. That did not add up to SAGA until I had almost all the crossings. 17a [Clarify in a patronizing way]. Actually, it’s MANSPLAINING. 29a [Country music] is a nice misdirect for ANTHEM. 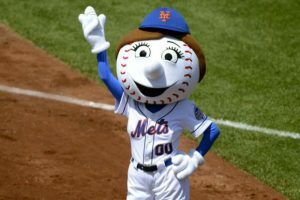 55a [She has a lot of stitches on her face] is MRS MET. I had not previously met Mrs (nee Lady) Met. Her first name is Jan.
What I didn’t know before I did this puzzle: see above re: “roman-fleuve.” I have also never heard of the trans-Neptunian minor planet, SEDNA. This puzzle doesn’t have a revealer per se, but the major hint to what’s going on comes at the grid-dividing down entry 7d, THE LOOKING GLASS [What Alice goes through to find “Jabberwocky” printed backward]. Every across answer on the right side of that entry must be printed backward, while every across answer on the left side is entered normally. Put another way, once you’re on the other side of THE LOOKING GLASS, everything is printed backward. There are a few across entries that are on both sides of the looking glass, and to avoid confusion they’re all palindromes (SOLOS, SOS, REVIVER, MGM, SELES). That’s really all there is to explain about the theme. I had a very early aha moment, followed by a strong desire to solve the rest of the puzzle using mostly just the down clues, since those are unaffected by the mirroring. The fact that this grid is only 72 words (a normal themeless/Friday word count) is very impressive, especially given how little crosswordese there is: HATREDS, ESCORTEE, BASALTS and OXES were the worst of it, which isn’t too bad. I find this puzzle really difficult to talk about because the theme is so simple to describe, and the solve is going to be so subjective based on how quickly you grok the gimmick. It feels like a good Thursday challenge. The fill is mostly unremarkable and the clues are on the easier side for a Thursday, both of which are totally in service of the theme, and reasonably so. I thought “HELL, YEAH!” (backwards), JAM-PACKS, and SPLIT RUN were highlights. [Aspen or Tahoe] is a nice misdirection toward resorts, but the answer is actually SUV. That’s all I’ve got. An interesting and well conceived Thursday puzzle. Until next time! We have another debut today, so congratulations are in order. Congratulations, Matthew! His intention was to help us solve his puzzle by giving us a LEG UP (38a, [Boost, and a hint to four of this puzzle’s answers]) — actually, four legs up, which reminds me of how my dog sleeps sometimes. But did the LEG UP actually make it easier or harder for you? 17a [Feature of “Animal House” or “Neighbors”] COL(LEG)E PARTY. This feels “green paintish.” Yes, college parties are things, but the phrase is not as in-the-language as frat parties, keg parties, or toga parties (see 47a TOGAED). 21a [Paul McCartney, for one] LIVING (LEG)END. I don’t know. Do you think Paul McCartney qualifies for this title? I’m feeling he’s not quite old enough. People like Betty White or Mel Brooks are LIVING LEGENDs in my book. 57a [Immigration debate subject] IL(LEG)AL ALIEN. This entry is kind of a downer what with the mess this administration has created. Nice theme despite one downer entry and one iffy entry. Getting these long phrases and their up-turned legs into suitable positions in the grid must have taken some doing. And to have the two upper pairs and the two lower pairs stacked upon each other for five letters just adds to the difficulty. To do all that and still get solid to very good crossing “GEL” entries (GEL PENS, AGE LINE, STAGE LEFT, and ANGELOU) is outstanding construction. And there’s even room for GAVE A DARN, CANAPES, AL GORE, and NO VACANCY. That’s a lot of good stuff, which typically means there are some prices to be paid. And there are in things like CO-LED, A LAP, NEALE, ELLAS, ALAI, ATEN, and ELYSE. And then there are your high-value vocab words MASERU [Capital of Lesotho] and PAVANE [Stately Renaissance dance]. That’s some tough stuff, but it is later in the week, so we should be able to work our ways through them. 23a [Capital of Lesotho]. MASERU. I don’t think I even knew of this country which itself is entirely contained within South Africa. 26a [Barnacle who was married to James Joyce]. NORA. New to me. Apparently their sexually explicit letters fetch high prices at auctions. Warning: NSFW. I’m no prude, but yikes! 36a [1940s Eagles head coach Greasy]. NEALE. This is the kind of trivia clue I could do without. 41a [GI, for one]. TRACT. I like this one. Good misdirection. 44a [Hotel turndown?]. NO VACANCY. Another very good one. 47a [Statuesque, perhaps?] TOGAED. Hmm. This assumes a large percentage of statued people are wearing togas. I’m not so sure about that. 53a [Tommy Lee Jones’s Harvard roomie]. AL GORE. More trivia, but at least this is in the present. Interesting. 68a [Show stopper?]. PAN. The N was the last letter I put in the grid and only because it seemed to make the most sense with the crossing (EVAN). I guess a bad review can end a show’s run, but there’s an immediacy in the clue that I don’t think is borne out in real life. 1d [Name on a razor]. OCCAM. Hmm. I would need some convincing on this one. 33d [Blocking direction]. STAGE LEFT. “Blocking” is the theatrical term for determining where the actors stand and when they move from place to place on the stage. Thanks to my kids and their interest in drama for helping me get this one. Overall, I feel like this was a fresh take on cluing even though some of them missed the mark for me. And while there are some downsides to the puzzle as a whole, there are more plusses than minuses. Four stars from me. I leave you with a video of a PAVANE dance, which is what you think of when you think of Renaissance dancing. Why they filmed this in a castle hallway is beyond me, though. It’s cute, I cracked what was going on when I didn’t have the squares necessary for IMESSAGE and IMPROV nicely fit the down clue. Remember MYA? Crosswords do, even if most of the music industry doesn’t. I have a big problem with BOAC in this grid. 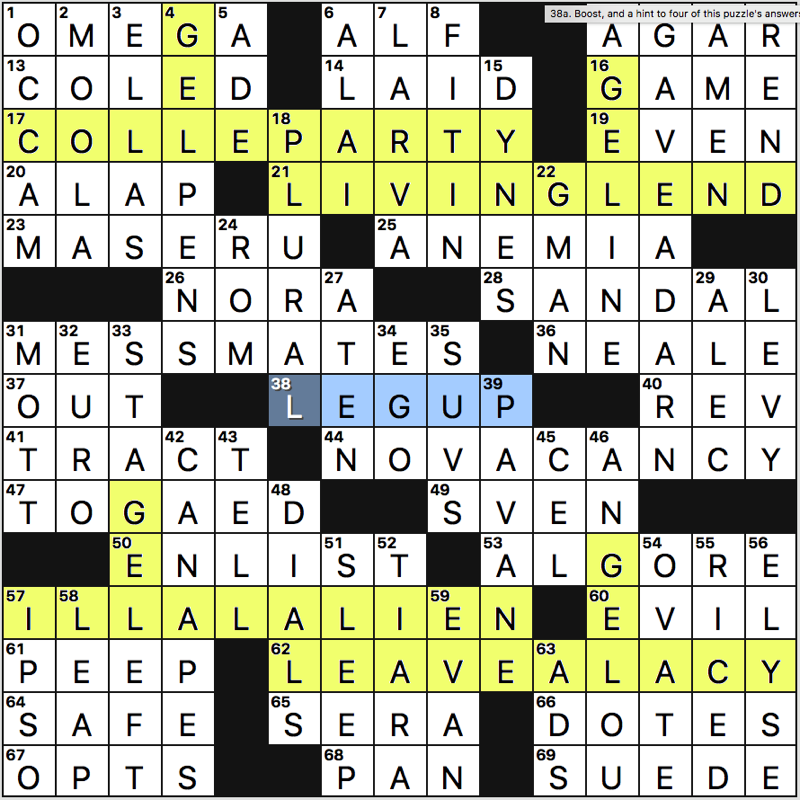 I don’t care if it is the sixth word of “Back in the U.S.S.R.”, it’s awful fill that has no business in a crossword. Other than this, it was nice to see IBERIA, DAHL (It just got announced Anne Hathaway will be starring in a remake of The Witches), KIT KAT, DRAW A LINE, JILL BIDEN, and VINDICATE. SMALL SHIP felt a little green paint-y. This felt forced. It must have started as a connection between stumped and lumberjacks, which is a good idea, but the execution was wanting for me. The REALLY in IMREALLYSTUMPED seems to just be padding for convenience. RIGHTINTHECHOPS doesn’t seem to have any real existence as a phrase. You can’t just make up your own answers, can you? Highlights: [Hillary supporters] for SHERPAS. The [usually] in [Fear or spiders, usually] for PHOBIA – phobias being irrational and fear of some spiders is rational. Lowlights: [Aesthetic feature?] for SILENTA. Baloney! Resorting to ERICII rather than redoing the section/puzzle and then throwing in hoary ELIEL for good measure. This entry was posted in Daily Puzzles and tagged Brendan Emmett Quigley, Jeffrey Wechsler, Matt Fuchs, Matthew Fuchs, Peter Gordon, Ross Trudeau. Bookmark the permalink. johnh asked about yesterday’s wsj puzzle if anyone was “a little queasy about invoking [mlk] only as a source for puns” – i found it a fun and well-crafted tribute with some great bonus material in the clues. 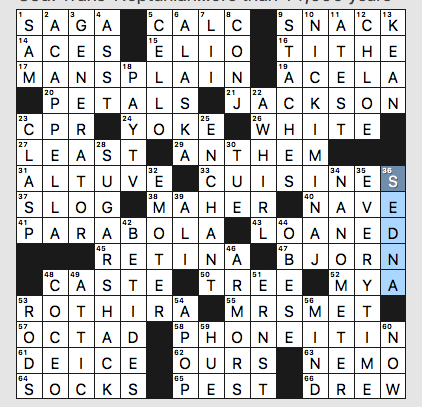 what queases me is when folks/brands want to perform their love for the sunlit path of racial justice on one day every year but can’t keep that same energy for the other 364… as is the case with 57a in today’s puzzle. Yeah, I found that entry terribly jarring, too. It carries extreme overtones of intolerance. I’m sure the author and editor don’t personally ascribe to those views, but I would have hoped they’d find something else containing leg. It ruined an otherwise good puzzle. Came here to say much the same thing. Glad to see others felt the same way. Agreed. Overall, I liked the theme and find McCartney easily a living legend. I did find the fill much too name heavy, on top of some dubious terms like CO-LED. When I did this puzzle today I enjoyed it, and added a half-star for Matthew Fuchs having the balls to include ILLEGALALIEN in today’s toxic environment, damn the torpedoes. I figured there would be repercussions in the comments section. Let it be said that there is at least one conservative who really enjoys reading Crossword Fiend each day (and contributing occasionally). 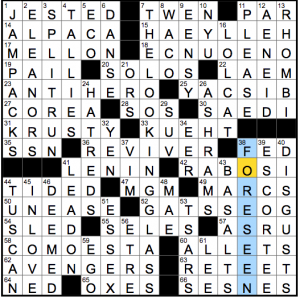 In general, I’m kinda weary of crosswords with backward (or turning) entries, but Ross’s NYT idea was really elegant and enjoyable. Clean, clear, nice! I could find no “contact” e-mail on the home page for a general query, so I am leaving a message here. I was getting caught up on some crosswords from the past few weeks and went back to check out the related conversations on the site. For one particular day/puzzle I typed out a comment, but when I hit “post comment” I was informed that the comments for the thread were closed. It would have been great to know that from the get-go so that I wouldn’t have wasted time composing the comment/contribution. Is there a way for the webmaster to have such thread closures indicated clearly, or the comment field blocked/grayed when it is no longer possible to post a comment? That would be very useful/helpful. I don’t think there’s a WordPress option for adding a “comments closed” notation, unfortunately. Comments are automatically closed on posts after 15 days, because the vast majority of late comments are spam. Also, hardly anyone is going to see a comment on a thread that old. BEQ – Really enjoyed this puzzle. Then again, I really enjoy almost all of BEQ’s puzzles. Minor quibble with the clue for 56D BOAC (Sixth word (okay, acronym) in “Back in the USSR”). Isn’t BOAC an initialism, rather than an acronym? I was taught that an acronym was pronounced as a word, while an initialism was pronounced one letter at a time. Outdated? I looked into this once and every dictionary I consulted defined an acronym to be both an acronym as you use it (a word) and an initialism. So, technically, all initialisms are acronyms. Kind of annoying, if you ask me, but not as annoying as the whole homophone/homograph/homonym thing. Gareth: I do not get your comment [Aesthetic feature?] for SILENTA. Baloney!. Are you disputing that the “A” is silent? My reading of the dictionary and the guide to pronouncing the word AESTHETIC seems pretty clear the “A” is silent. If you have a different complaint, what is it? As far as making up words, that is the history of language. IMO. But, you can see RIGHT IN THE CHOPS here. I’d like to think that fear of spiders is irrational. Caution, on the other hand, is justified and recommended for any unknown. WSJ–Seems to me that the clue for 37A should be “UNavailable for purchase” which makes “out” as the solution more appropriate.. In the publishing world, “out” means “published” and thus available for purchase (as in, “Is that new Harry Potter book out yet?”). O.K., but there is a whole world out there that does involve publishing. I had David’s thought, but in due course I figured it out and was quite comfortable with the ambiguity. Although I can’t speak to timing, David has given permission for links to the day’s puzzle(s) to be included on the Today’s Puzzles page here. In addition, Bob Klahn and Will Johnston have added calendar pages, for both the dailies and the Sundays to his Puzzle Pointers site. These pages are now live and point to all the Steinberg-edited puzzles published to date. 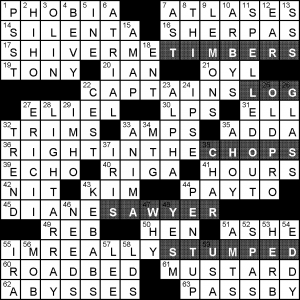 BTW, the Puzzle Pointers page is included in the Crossword Links page, also found at the top of this page. Fantastic! Thanks so much to everyone who makes these crosswords available. That’s great news! Thank all concerned for their efforts and results! I managed to get a hold of the NYT and loved it. Just long enough figuring it out (and entering some the wrong way) to have a terrific AHA moment. It felt like a special bonus that the central across entries had to be palindromes. Makes up for putting up with two Simpsons entries and ESCORTEE. 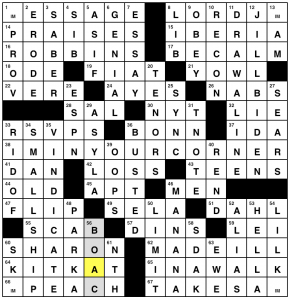 (Why in the world are The Simpsons so important to Will Shortz?) Slowed me down that at first I had UNREST for UNEASE and PRESTO for the magic word. That Fireball #123 was a smug, show-offy zero-fun Natick-fest. being hard because of wordplay is one thing. But loading up on obscure and random fill? That’s just plain sneering. Sorry but no thanks.